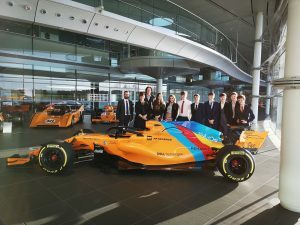 Eight students from Rainford Sixth Form are feeling inspired after a recent visit to McLaren Group’s headquarters in Woking. Year 12 students from the sixth form’s dedicated magazine ‘Informed’ and the publication’s organiser, Harrison F Carter, founder of Creativity in Mind, visited the impressive site to interview the operations director and learn more about careers in the automotive industry, in order to promote STEM opportunities to the magazine’s young readers. The team were given VIP treatment as they looked around the state-of-the-art facility which took them behind the scenes of cutting edge car manufacturing and technology. Following a tour of McLaren’s F1 legacy, the students were given privileged access to the production centre and the wind tunnel facility where the engineering of these powerful vehicles is fine-tuned and developed. Students were also able to experience the staff gym which houses an Olympic sized swimming pool and F1 trainers at their disposal. The on-site Michelin star staff restaurant even provided a wonderful selection of food for them to enjoy. Finally, the budding journalists had the chance to pose their burning questions to Alan Foster, the operations director at McLaren, who originally hails from Liverpool. They found out about his route into this career and offered a wealth of advice for students keen to enter this industry. Concluding the memorable day, students and staff even had the opportunity to sit in the latest McLaren 720S and were given parting gifts to remember the day. Rainford Sixth Form is part of Rainford High. The modern and purpose built sixth form provides for approximately 300 students and is large enough to facilitate a broad range of subjects and experiences, yet still ensure all students are known as individuals and are personally supported.